When acceptable temperature and humidity are maintained, natural hardwood flooring retains its geometrical dimensions very well. 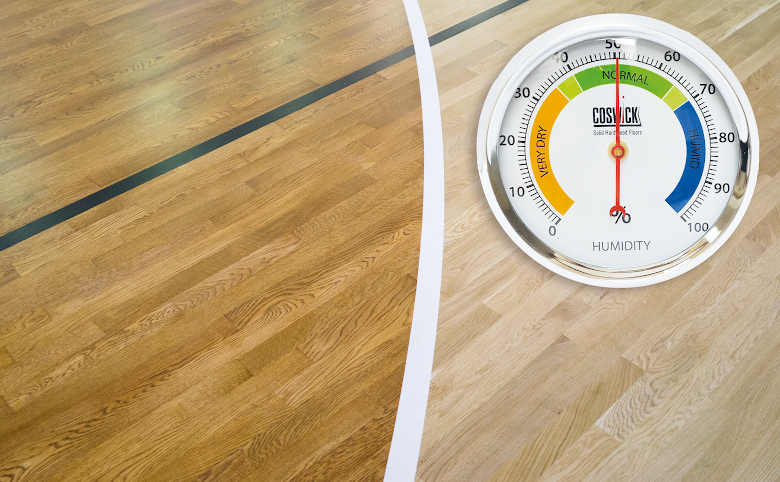 Interiors where Coswick floors are to be installed need to maintain temperature in the rage of 15-25°C and relative humidity in the range of 40 – 65% (for engineered hardwood flooring), and 45 – 55% (for solid hardwood flooring). While methods for ensuring the proper microclimate might differ, it is imperative that it is continuously maintained based on accurate measurements of indoor temperature and humidity. Ensure absence of abrasive particles (dust, sand) and contaminants (stains, dirt), by means of regular cleaning and maintenance. Use designated cleaning and repair products to ensure timely renewal of the wear layer of the protective finish. To reduce ingress of abrasive particles and contaminants, place trapping mats at all entrances. • Abrasive particles must be removed using a vacuum cleaner with an attachment that does not damage the protective and decorative finish (such as a bristle border) or a mop equipped with a deep cleaning pad, which prevents contact of abrasive particle with the floor surface. Frequency – it is necessary to carry out cleaning as soon as abrasive particles appear, but no less than once a week. • Water-soluble contaminants are removed using a microfiber pad, slightly moistened with a designated maintenance product (Coswick cleaner, concentrate). Cleaning can be done either manually or by using cleaning equipment. 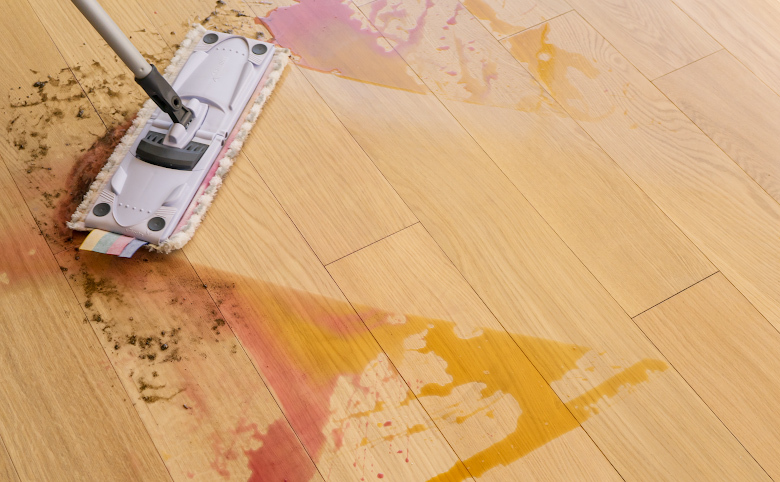 Ensure that no over moistening of the flooring surface occurs. Frequency – it is necessary to carry out cleaning as required, but no less than once a month. • Hard-to-remove stains can be removed manually, using soft cloth and Coswick specialty cleaner. Frequency – clean as often as necessary, but this procedure is normally carried out immediate following cleaning of all water-soluble stains. Coswick Hardwood Inc. manufactures and supplies a full line of cleaning and maintenance products. 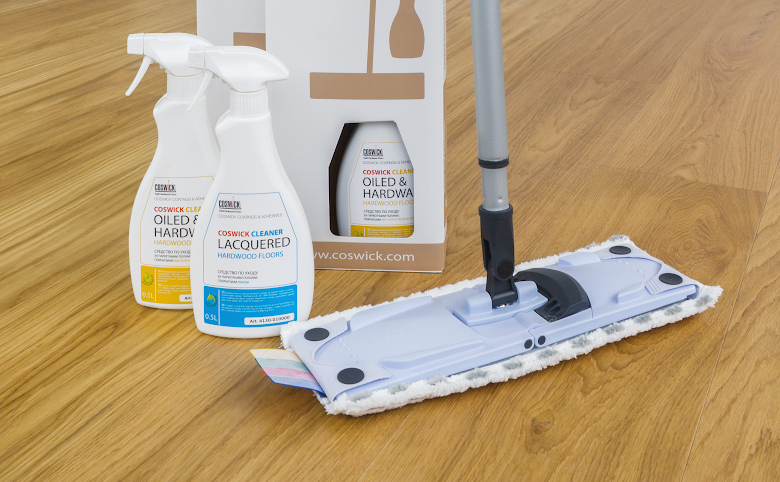 Coswick cleaning products undergo regular testing, are eco-friendly, and ensure long-lasting protection for Coswick surface finishes. The need for special maintenance is due to the fact that sports lacquer, which conforms to the requirements of sports flooring standards, may gradually get worn off over time as a result of intensive use of soft sports footwear, and may become more slippery. Additional maintenance procedures are aimed at maintaining the functional characteristics of the flooring surface that depend on the condition of the protective finish, and include slip resistance, level of gloss and reflectance. As an added bonus, regular maintenance extends the life of the surface finish. After cleaning the floor, apply designated film-forming agent, and polish it onto the surface. In small interiors, the process can be done manually using a soft cloth or pad. In large gyms or arenas – use a polishing machine with a soft pad. Frequency – perform as often as necessary, but no less than once every 2 months. Carry out on a clean surface only. Coswick recommends its ready-to-use Sport Cleaner-Restorer (packages of 5 litres for a single treatment of 500 sq. m. of sports covering). For additional consultations on issues related to the operation of sports floors bearing the Coswick trademark, please contact your regional distributor or Coswick Hardwood Inc. directly.